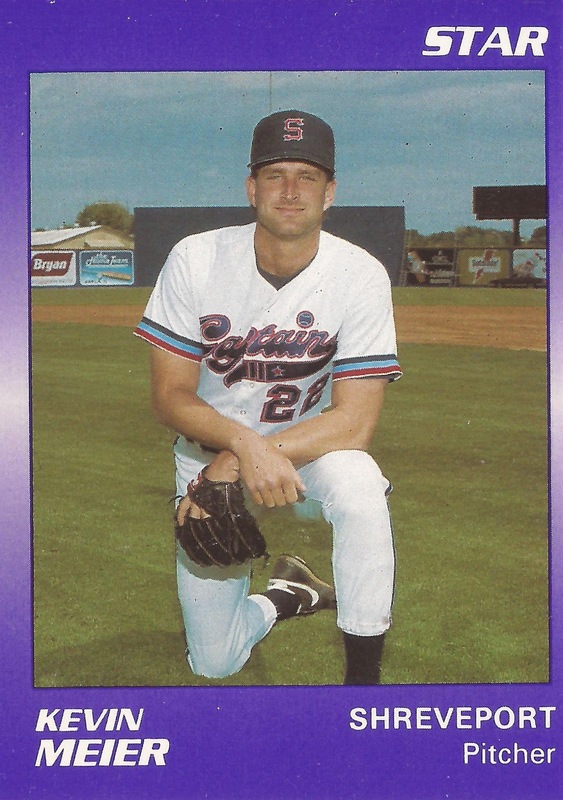 Kevin Meier arrived in the Cubs system in 1995, his ninth as a pro. He'd seen AAA over four of those seasons, but he hadn't seen the majors. Meier, playing for AA Orlando that May, told The Orlando Sentinel he still believed the bigs might be in his future. "I've had some pretty good years. . . . but for whatever reason I haven't gotten the call (to the majors) yet,'' Meier told The Sentinel. ''But I'm having fun, and I still hope to make it to the majors before I'm done." Meier made it back to AAA that year, but he didn't make the majors. That season marked the end of his professional career. Meier's career started in 1987, taken by the Giants in the 20th round of the draft out of Georgia Southern University. Meier began with the Giants between rookie Pocatello and single-A Fresno. He went 6-2 overall in 19 games, eight starts. He made AA Shreveport briefly in 1989, by then serving as a full-time starter. He split 1990 between Shreveport and AAA Phoenix, going 11-8, with a 3.63 ERA. After a 1991 season back at Shreveport with the Giants, Meier moved to the Cardinals and AA Arkansas for 1992 after a trade. A Connecticut-native, Meier told The Hartford Courant that the Cardinals seemed to have a better plan for him than the Giants did. "The big thing is the confidence the organization has shown in me," Meier told The Courant. "It's a lot easier when you know you're getting the ball every fourth or fifth day." Meier went 11-6 at Arkansas, with a 2.58 ERA. He then made AAA Louisville for 1993. His ERA increased to 5.80. He played 1994 at AAA Colorado Springs with the Rockies, then arrived with the Cubs for 1995. Meier got 11 starts at Orlando, then three outings at AAA Iowa that year. He gave up 10 earned runs in 10.2 innings at Iowa, ending his career. Meier has since returned home to Connecticut, working for ESPN. In 2015, The Meriden Record-Journal featured Meier and his website PlanetProspect.com aimed a helping high schoolers get their information to college coaches. "I tell the kids it requires a little work," Meier told The Record-Journal. "It's like doing a resume. We have to sell ourselves a little bit unless you are blue chipper. But if you want to play in college and get some money, it will take time to build a brand yourself."